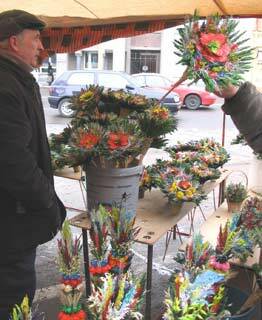 Each year spring in Lithuania signifies a grandiose and fascinating event for all the craftsmen, also those, who value folk art and who like to have a good time. 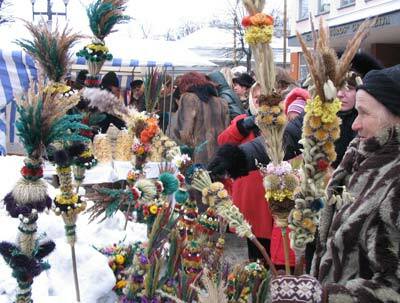 In the very first weekend of March a huge trade fair is organized in Kazukas according to an ancient tradition. Although its “epicentre” is situated in the centre of Lithuania – Vilnius , other cities don't remain aside. Nevertheless, the Vilnius trade fair is the most unique! During these days Vilnius turns into the place of pilgrimage for a great number of tourists and guests of the city. Travel agencies prepare their tours beforehand and the city hotels are crammed with influx of foreigners. Foreigners are not just guests here, craftsmen from the neighbouring countries also like Kazukas's trade fair. Why not come here with their goods? Poles, Byelorussians, Estonians come – trade fair is ready to welcome everybody! 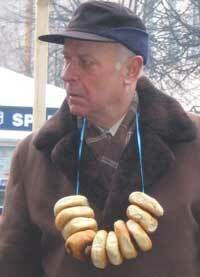 And, of course, many local craftsmen from all parts of Lithuania try to come for the Kazukas's trade fair in order to put for sale the creations of their hands. One street is not enough to accommodate all of the willing! Many squares and streets of the old city turn into endless trade lines! Everything can be found at the trade fair of Kazukas! The makes of rod and leather, wood and amber, ceramics, paintings, dolls, many self-made souvenirs, among which the most respected are little witches. Merry noise is done by musician and holiday treating is prepared right here: snacks crackle tasty on huge frying-pans. And, of course, there is bear, which just floods. Exotics also can be found – county “live” bear – everybody gave up drinking it long ago. It is turbid in the light, but so popular! Where else can you try it? Maybe because the Baltic countries are very small, or I'm simply very lucky, – I meet the president of the country each time I visit any capital trade fair! Each Lithuanian considers his duty to buy a willow at the trade fair of Kazukas, it is not important even which one – it may be small dry bush, or a two-meter master's composition from dry flowers, whatever one can afford. According to an example of local citizens, the foreigners too do not refuse themselves in this pleasure, and if you go by public transport in city – then you will admire willows even longer... in hands of the neighbouring passengers. There are different willows for sell at trade fair. It is a matter of taste and personal imagination. I've seen willows-feathers and willows-wooden blocks , dry willows, straw (thatch) willows, willows knitted from threads and worked (glued) from dry flower boxes, willows from фанировки and the most fashionable squeak - willows from usual wooden sticks, which are beautifully shaved into a spiral... (this new design was somehow bought in a queue). The Vilnius willows are the most beautiful. 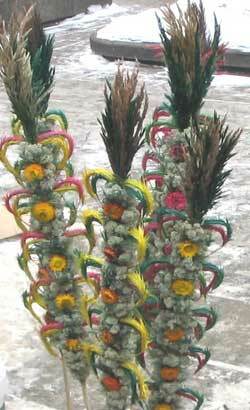 They are traditionally made of dried and painted plants by putting all details in a freakish bright composition. The willow is prepares especially for Easter. There will not be any more trade fairs till Easter, therefore it should be taken care of beforehand. 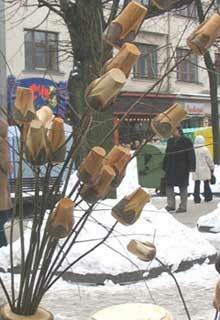 And everyone will carry its willows to church for consecration one week before Easter, on the Willow Sunday. It is considered that the consecrated willow has special properties – it protects the house from evil spirits. 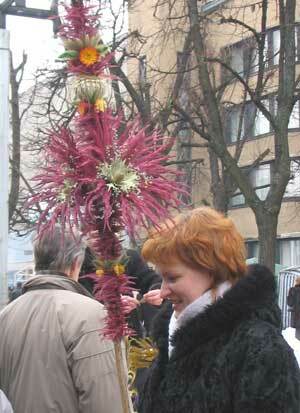 The Lithuanian beauty-willow is a symbol of palm branches with which the Christ was worshiped long ago. Because there are no palm trees in a local climate, they take whatever is closer at hand – dried florets, the ears of wheat or other herbs, connecting all of this in the freakish method into one whole. It turns out very beautiful! Yet, why does everyone call the trade fair by such a tender man's name – trade fair of Kazukas? It turns out that the history of this fair leads its roots 400 years back into the Middle Ages. This holiday is dedicated to the patron of Lithuania – saint Kazimeras. It later then, when Lithuanian people named the trade fair with so much love – fair of Kazukas . The king's son Kazimeras devoted his life to serve God, having understood that all pleasures of royal life stand for nothing. He only lived 26 years, since 1458 till 1484, and has been later on canonized by the Pope of Rome. The relics of saint Kazimeras rest in an ancient silver coffin of skilful work in the Arch cathedral in Vilnius . The fair of Kazukas as is dedicated to the day of his birth – March 4, however it lasts the whole three days! Having walked along the streets and lanes of Old Vilnius, having seen the works of folk craftsmen, having listened to alive music, one can feel the spirit of ancient, original Lithuanian culture. There's a lot of fun at this fair, and the most important - there's a lot of truly unique creations of folk masters.